BUNDLED SET: Please do not purchase if you already own sets 1, 2, or 3 of this resource. Thanks for carefully reading descriptions to prevent duplicate purchases. 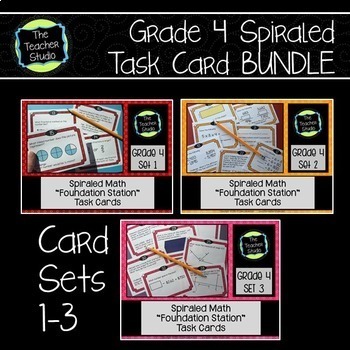 This is a bundled set of the first three sets of 32 task cards in my 'Foundation Station' resource that supports the Common Core and other rigorous state standards and allows for teachers to “spiral” their instruction to make sure students keep fresh with all the ideas in the curriculum. So often we teach a unit (for example, a 3 week geometry unit) and then we don’t revisit the skills and concepts and students lose those neural connections! These task cards can help—each set addresses a full fourth grade curriculum and each set gets progressively more rigorous. Sets one to three takes fourth grade standards and provides practice at a most basic, foundational level--and this is the third set which gradually builds on the skills in set one. As the sets progress, the skills are presented in different formats and with different levels of sophistication. Different sets are colored differently and labeled to make organization a snap! 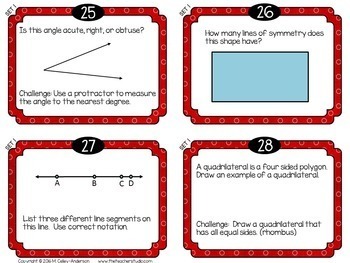 Many cards have a “challenge” piece to help with differentiation opportunities. Even from set 1 to 3 you will see an increase in challenge level. Pages can be printed, cut into quadrants, and laminated to use as task cards (color version) or can be copied and cut apart to use in math journals or as practice sheets. Pages are included in color AND with white background for easy copying. There is also a blank set of cards where students (or you) can write their own task cards and all answers are included. Finally, blank “recording sheets” are included if you wish to have your students record their work in one organized place. Consider using as centers, as warm ups, as homework, or even as formative assessment tools to see how students are doing. 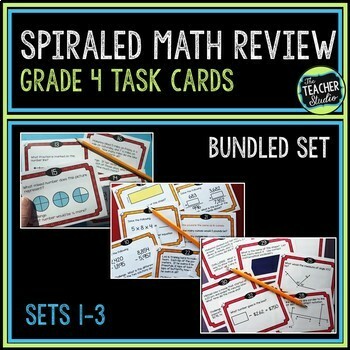 Watch for more sets and bundles to keep the spiral working all year! To keep each set a manageable size, different sets will “weigh” standards a little differently. For example, the first set has less emphasis on the more rigorous standards that are typically taught later in the year and focuses more on foundations that support later sets. Watch for more sets and grade levels! Want to see more? Here are the other listings for you to check out!